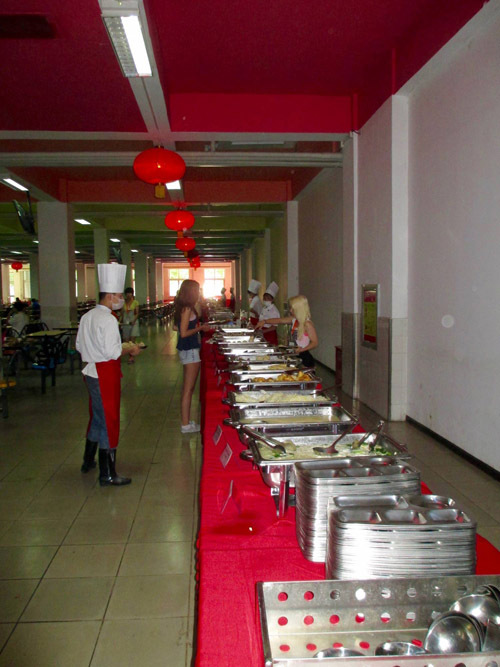 Any hope of trying authentic Chinese dishes while staying on campus at a university in Beijing were dashed on my first day as I walked the length of the cafeteria where all sorts of unappetizing options were offered to over a thousand international students, teachers and company representatives. Suffering from jet lag and no more than three restless hours of sleep in my upper bunk, I mindlessly shuffled past all sorts of breakfast offerings with my metal prison tray. I tried not to be discouraged, but none of it looked like it was supposed to, and I wondered if the folded cards labeling each dish were some form of sick joke. “Maybe they’re Chinese pancakes,” he replied. On the other side of the room, I watched several Chinese student-volunteers ladling a thick colorless goop called congee onto their trays. It didn’t look very appetizing, but I scooped some on my tray before finding a quiet place to eat. It seemed to be made of rice, but that was just a guess. It was neither hot nor cold, and it tasted like wet cardboard. I went back to try one of the Chinese pancakes. These dense, deep-fried flattened dough balls also tasted like wet cardboard. I was beginning to see a theme develop. After soaking a few of these pancakes in some runny yogurt, I managed to get them into a digestible texture. This was not a promising start to the next ten days. For dinner that evening I saw students quickly pile up their prison trays with pizza and spaghetti, which they soon realized wasn’t really pizza and spaghetti but a Chinese version of pizza and spaghetti. Again I tried to balance my selections. I piled half my tray with the same dishes the Chinese student-volunteers were eating, and the other half with Chinese versions of Western dishes. All were lukewarm; all tasted like wet cardboard; all were consumed based solely on my body’s need for calories. I knew it was bad when I started to salivate at the memory of airline food. Lunch that first day had been in a fancy restaurant downtown where an army of waiters in pristine white shirts presented us with the world-famous Peking duck. Dozens of delicious vegetable and tofu dishes came flooding out of the kitchen and we hungrily filled our stomachs, hoping every lunch was going to be this good. At the time we had no way of knowing this would be the only culinary highlight of the entire ten days. The next day’s breakfast and dinner menus were exactly the same offerings as before. Variety, it seems, was not something I could look forward to when it came to food selection at the university cafeteria. I had to keep reminding my students, many of whom were starting to skip meals, that it was more a matter of putting calories into our bodies than enjoying the taste of anything. By the fourth day, we had all found creative ways to alter the taste and texture– either by combining foods or washing it down with the flat warm Coca-Cola that accompanied every breakfast and dinner. Whenever fresh fruit appeared (once every few days), many students stuffed apples and bananas down their shirts and squirreled them away in their dorm rooms. I survived the next few dinners on Indo-Chinese curries that featured some sort of indescribable meat. 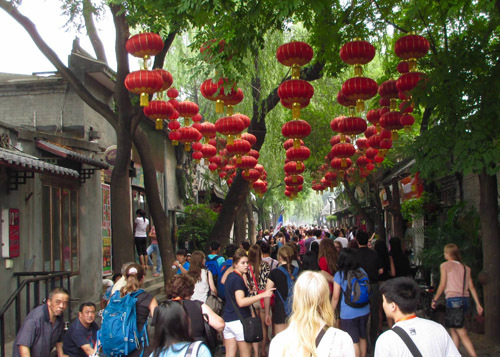 On the seventh day, we visited the hutongs in the old section of the city. These narrow alleyways provided a window into traditional Chinese courtyard living but, like other tourist hotspots, it was more about cheap goods in small stalls than any sort of history lesson. Unlike the Silk Market shopping centre, where fluorescent lighting and marble tile flooring created an ultra-modern environment, the hutongs offered a slightly more authentic shopping experience. With hostels and international eateries, it had an oddly bohemian atmosphere. As busloads of students piled out and streamed down the main alleyway, I could hear a crescendo of excited murmurs. Though they were understandably cautious, several students congregated in front of gourmet hot dog stands, while others flocked to pastel-coloured cream puffs. The smell of cinnamon and sugar from a churro stand wafted down the alley and made everyone’s stomachs growl. I continued further in, trying to escape the throng of teenagers, and then I recognized something familiar – a green ring around a black and white design of swirly lines. I squinted towards the far end of the alleyway, but only when I passed a couple of shoe stores and an older Chinese man offering spray-on temporary tattoos did I realize why it was so familiar. I knew it was cheating. But I didn’t care. I was dying for a caramel macchiato. A few minutes later, with drink in hand and seated on a throne-like chair that may or may not have been purely for decorative purposes, I was soon joined by a fellow teacher from an all-girls’ private school in Sydney, Australia. Like me, Anika had been struck by divine intervention. Like the magi following the star of Bethlehem, she too had followed the siren of Starbucks and together we sat within the walls of the air-conditioned multinational cooperation, tuning out the sounds of frantic customers looking for their caffeine fix. On the way back, we spied Canadian teachers Josh and Jonathan at Wiggly-Jiggly’s. Like many of the themed cafés in the hutongs, this Jamaican beach hut-inspired eatery seemed out of place in downtown Beijing but, with wide grins and tears of joy, Josh and Jonathan were excitedly scanning the menu. Josh finally ordered a club sandwich and Jonathan ordered a Jamaican sausage and bean dish. “I’m sure it’ll be fine,” I said. “It’ll be fine,” I repeated. Secretly I wasn’t so sure. The four of us sat in comfortable silence, watching a steady stream of people walk by the front window. There was no need to say anything. It had been a long week, full of crippling heat, smog and terrible food and, as we mindlessly sipped our drinks, we felt like weary soldiers recently returned from the front lines. Ten minutes later, Josh was unceremoniously presented with his club sandwich. It looked like a club sandwich, but the rest of us waited in anticipation as to whether it tasted like a club sandwich. After a couple bites, Josh carefully placed his sandwich back on the plate before taking another drink. “It actually tastes like a club sandwich. I’m not kidding,” he said. He picked up his sandwich and, without another word, devoured the rest of it. There was no sign of Jonathan’s food. With only fifteen minutes left before we due back, Jonathan nervously turned towards the kitchen to see if there was any sign of his lunch. The kitchen looked deserted. Desperate, Jonathan walked towards the back counter to find the waitress. She was watching a small television. “I need to go soon,” he said, slowly enunciating each word. “Is my food coming?” He tapped his wrist to indicate the movement of time. A few minutes later, we witnessed a tense argument between the waitress and the cook. Suddenly, the cook screamed something and stormed off. Our comfortable silence became an uncomfortable silence. Undeterred, the waitress stepped behind the back counter and pulled out a single sausage from the small freezer before placing it on the hot plate. While the single sausage was slowly defrosting, she then pulled out a can of beans from the fridge. The label was faded and the top was covered in well-used plastic wrap. The waitress looked at the can of beans like maybe something wasn’t quite right – as if it had been lost in the depths of time and space. She peeled off the plastic wrap and took a sniff. Then she hesitated. She sniffed again. And she hesitated again. My rule when it comes to mysterious food found in the back of the fridge is ‘when in doubt, throw it out’. But the waitress didn’t throw it out. Instead she passed the can of beans to another waitress who suddenly appeared from the back alley. The second waitress looked at the can of beans and took a sniff. Then she hesitated. She sniffed again. And she hesitated again. The second waitress wiped down a couple tables with a dirty rag while the first waitress scooped two tablespoons of beans onto a plate before stretching the well-used plastic wrap over the can and putting it back into the fridge. With only five minutes before we were to meet at the bus stop, the waitress pulled the beans out of the microwave, cut up the single sausage into four bite-sized pieces, and served it to Jonathan with some white toast. Without any time to question the food, Jonathan wolfed down his lunch. I couldn’t watch. 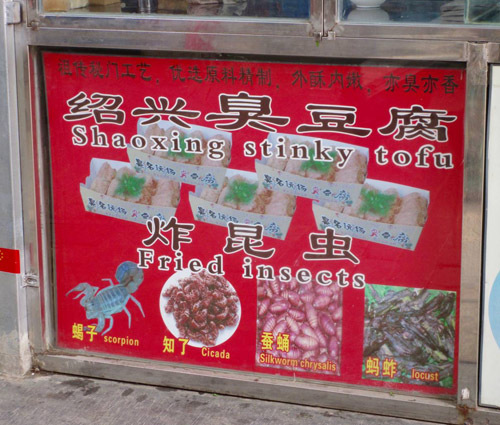 I had eaten freshly grilled baby scorpion a couple days earlier, but this was way too much for me. I turned my head while Jonathan scooped the last of his beans onto his toast. The four of us then quickly cut through the crowd so we wouldn’t be late. In the crushing mass of teenagers, I lost sight of Jonathan. Only when all the students were accounted for and on their appropriate busses, did I see him again. He was sitting on the curb with his head between his knees. He didn’t look well. Despite the heat and humidity, he was ghostly pale and shivering. “Anything I can do to help?” I asked. Jonathan was on the same bus as I was, and he valiantly helped with the final head count before falling into his seat. Five minutes later he was asleep, his head tilted at an awkward angle. When we arrived at the university campus an hour later, Jonathan didn’t look as pale. Still unsure on his feet as he walked off the bus and in through the front gates, he mumbled something about never ordering beans again in Beijing. “Are you feeling any better?” I asked. More about and by this author on his own website.